For this latest edition of Rambling Reviews, we delve into the unexpectedly wild world of wheat beers. And like the best wheat beers, the reviews are simple and direct. Let's get right to it. First up, "Fierce" from Chicago's Off Color Brewing, a Berliner Weisse. It's cracker crisp, with a zippy, light lemony sour tang. They use the old "lactobacillus in the kettle overnight" trick for the sour part, but don't let the "Fierce" name fool you, it's really not THAT sour. Tastes like a Lemonade Radler, except they don't use any lemonade. "Fierce" packs a simplicity punch and I enjoyed sipping a few of these on my front porch. Next up, Blue Moon Cinnamon Horchata Ale. That's right, Blue Moon Cinnamon Horchata. After passing this beer sitting in the beer cooler at my local Safeway day after day, always wondering "Exactly how does that taste?" I finally broke down and picked up a six-pack to satisfy this itching curiosity. It tastes like a wheat beer with a little sweetness, a little cinnamon, with some lightness that might come from the long grain rice its brewed with. Yes, I kind of liked it. My wife's reaction to this was a far less charitable. "Bleech!" 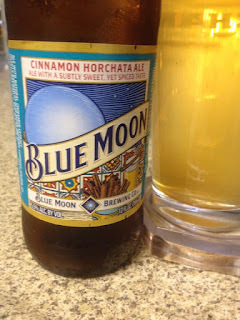 OK, cross Blue Moon Cinnamon Horchata off my bucket list. Last, but certainly not least, it's Pizza Orgasmica's 4 Grain Hefeweizen. I'm in San Rafael a lot since I have close family there, so we often head on over to Pizza Orgasmica in downtown San Rafael. I've grown fond of this Hefeweizer of theirs, which probably sends old world German brewmasters spinning in their graves. Brewed with barley, wheat, oats and rye, it's grainy, with a thick mouthfeel and lots of underlying clove-like, spicy aromatics, missing the traditional style in a good way. Weird enough to be wonderful and oddly refreshing. In Bend, beer truly is everywhere. With at least fifteen breweries crammed within, Bend seems like some sort of economic experiment to determine just how many breweries a town of about 80,000 people can actually support. Starbucks competes for with quiet reading spots with beer bars. You can get your growler filled at a gas station. One wonders just how much more locally brewed beer Bend can soak up. Standing in line at the seafood counter at a Bend grocery store to get clams and mussels for Sunday evening's paella, I notice shopping cart after shopping cart being pushed by holding six-packs of Coors Light and Budweiser. Even in Bend, craft beer still has plenty more worlds to conquer. From all appearances, you'd think Boneyard Beer started when a bunch of guys fixing motorcycles one day decided to brew beer instead. We roll into Boneyard around noon Sunday and people are already coming and going, getting their growlers filled for the day. There's no place to sit, so we stand around sipping from our little sampler glasses in a sparse empty space that mostly likely was once a waiting room for a repair shop. For all the thrash/metal inspiration, the beers are the brewing equivalent of a collection of Barry Manilow tunes: well crafted, hitting all the right notes, though not particularly daring or breaking any new ground. Everyone should have a local brewery within walking distance. 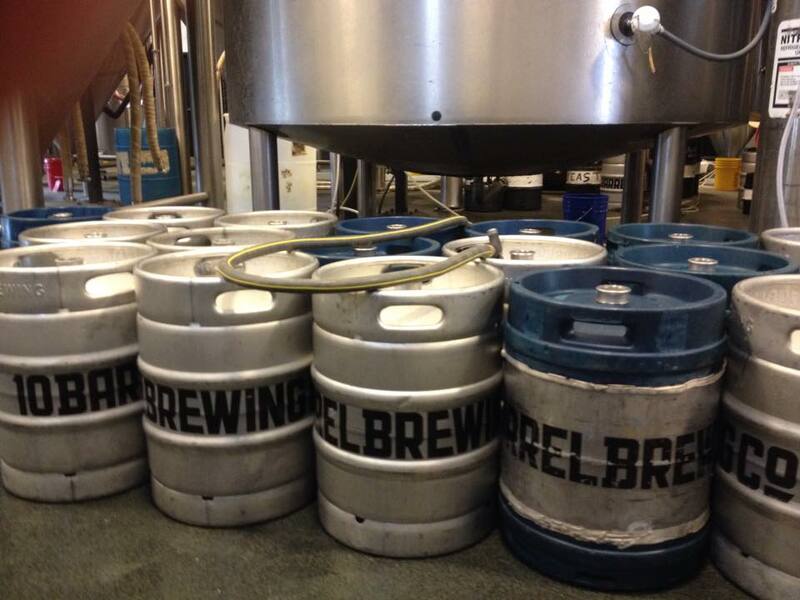 For our friends in Bend, that place is Good Life Brewing. We walk about a mile through town to Good Life, located near one of Bend's many traffic circles. I ask out waitress how long Good Life's been there. She guesses 2009. Going back to the kitchen, she finds out was it was founded in Bend in 2011, basically making it one of the Bend's middle aged breweries. The beers taste soft and comfortably worn around the edges. Good Life seems like a good place to effortlessly while away an hour or two in the neighborhood. So that's what we do. Whenever I asked about where to go for beer in Bend, everyone told me I had to go to Crux Fermentation Project. They were right. Saisons scream with flavor at just the right volume without being overpowering. Sipping a simple Porter, I unwittingly stumble onto a coffee bomb. My only nitpicking complaint was that the sours were barely sour, understanding many would find an un-sour sour something of a virtue. Looking around in the friendly, chattering space, I realize in Bend, sipping barrel-aged beers while high end pub food is lots of people's idea of good family time out. Or a loud date night. It would have be indelicate to sample the entire tap list so reluctantly, I had to resist the temptation to do so. On a cool, clear Labor Day weekend, my wife and I headed up to Bend, OR. While we looked forward to reuniting with friends who recently moved there from Cupertino in the Bay Area, it was also a chance to check out the thriving brewing community in Bend. Just two hours after our arrival in town, we headed over to 10 Barrel Brewing's production brewery for the week;y 3:00 pm Friday tour. By now you know, 10 Barrel was acquired by Anheuser-Busch last November. Located on the Northeastern edge of Bend, the brewery seems both physically and spiritually disconnected from the rest of the city. Early in the tour, our guide points out the original 10 Barrel system that gave the brewery its name. Someone asks "What is malt, exactly?". While our guide struggles to answer the question, what she lacks in beer knowledge, she easily makes up with raw genuine enthusiasm for 10 Barrel's beer. The brewery buzzes with activity, forklifts beeping and humming around the brewery moving around pallets seemingly at random. Even late into the afternoon on Friday, brewery bustles with energy, striving for escape velocity well beyond Bend, fueled by Anheuser-Busch money. As our small group dodges forklifts and looks at all the shiny new brewing equipment while sipping from complimentary bottles of Apocalypse IPA, we are sufficiently primed for the long weekend. 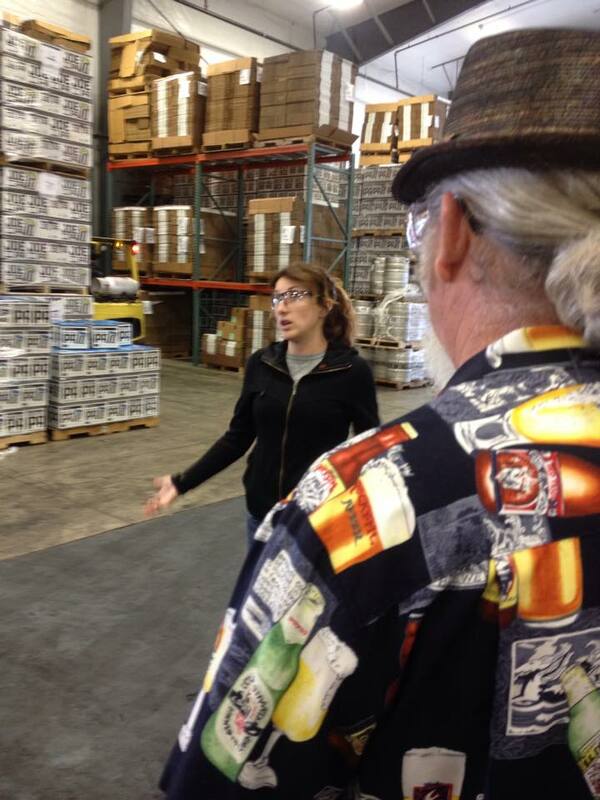 Natasha is begging us to bring up uncomfortable issues in the beer community for this month's Session. OK, I'll bite. It's about beer festivals. They're basically sanctioned binge drinking and becoming increasingly irrelevant. Most festivals I'm familiar cost over $50 in an "all you can drink" format so most festival attendees go through 8-12 four ounce pours in order to get their money's worth. This all adds up to 3-5 standard 5% abv servings. Of course, most beers pouring at beer festivals are way over 5% abv so most the typical festival attendee is consuming over four standard servings of alcohol. Yes, there is considerable debate about what actually constitutes "moderate drinking" but it's highly doubtful any reasonable definition of "moderate drinking" would describe most people at a beer festival. As far as personal health goes, a beer festival may not be any worse for you than going to a barbecue festival or even eating a big bowl of ice cream. It's just that drinking that much beer at any one time is simply not good for you. Suffice to say that after drinking this much alcohol in the course of the afternoon, one could not legally drive an automobile for at least a couple hours afterwards. While most beer festivals encourage people to use designated drivers, taxis and public transportation and many attendees do, one suspects a significant fraction leave the festival driving in their cars over the legal blood alcohol limit. Like it or not, beer festivals raise public health concerns. A lesser point is that beer festivals are becoming irrelevant with the growth of craft beer. There was a time it was hard to find craft beer and if you were lucky, it was one or two choices at a bar somewhere. Festivals were often the only way craft beer drinkers could discover new breweries and craft breweries could get badly needed exposure. Now, with many breweries having tap rooms and plenty of beer-centric bars with tap lists easily exceeding twenty selections, it's a lot easier to discover and explore craft breweries at a fraction of the alcohol and expense of a beer festival. As you can probably guess, I'm going to a less beer festivals these days than I used to. That said, beer festivals still have their place and I still enjoy the ones I go to once or twice a year. It's just that when the loud cheering starts whenever the taster glasses start crashing to the floor, that's my signal to leave.